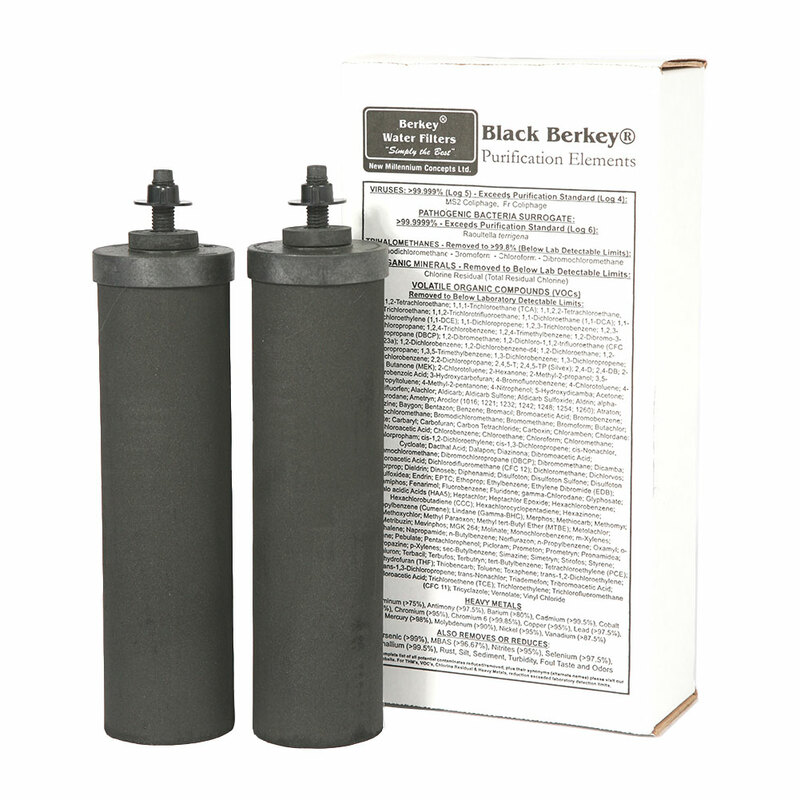 Black Berkey Purification Elements are the most powerful gravity filter elements currently available on the market. In fact, the Black Berkey water purification elements have been tested with more than 10,000 times the concentration of pathogens per liter than is required by standard test protocol. This concentration of pathogens is so extreme that the post filtered water would be expected to contain 100,000 or more pathogens per liter(99.99% reduction - the requirement for pathogenic removal). Incredibly the purification elements removed 100%. Absolutely no pathogens were cultured from the effluent or were able to be detected by an electron microscope, setting a new standard in water purification. Black Berkey water filters are so effective, they can remove red food coloring from water without eliminating the beneficial minerals your body requires. To the best of our knowledge no other filtration element can duplicate this performance. The powerful Black Berkey water filters also remove or reduce viruses, pathogenic cysts, parasites, harmful or unwanted chemicals such as herbicides and pesticides, VOCs, detergents, organic solvents, cloudiness, trihalomethanes, silt, sediment, heavy metals, foul tastes and odors, yet they leave in the healthful and beneficial minerals that your body needs. Black Berkey water filters last for more than 10 years. No need for expensive disposable filters. Black Berkey water filters are re-cleanable. When the flow rate decreases simply brush the Black Berkey water filters with a ScotchBrite pad under running water, reinstall and your system is again ready to purify water. Each durable and efficient filter will last for up to 11,350 liters (22,700 liters per set of two) and provide you with years of efficient water purification. For instance; If you were to use 38 liters per week, this is equivalent to 600 weeks. That's more than 11.5 years of clean water! What's even more unique is that the Black Berkey water filters are self-sterilizing. See the latest test results by the Environmental Toxicology Laboratory of Los Angeles. Learn how Black Berkey filters are able to remove viruses. Also removes or reduces: rust, silt, sediments, detergents, cloudiness, iron, nitrates, organic solvents, foul taste and odors. How the Black Berkey water filters work. The unique Berkey design combines the age-old process of micro-porous filtration coupled with modern state-of-the-art technology and the highest quality materials to bring you the finest water purification system available anywhere. The micro-pores within the self-sterilizing and re-cleanable Black Berkey water purification elements are so small that pathogenic bacteria are simply not able to pass through them. Another reason Berkey water filter systems are so effective in removing contaminants from water is the extremely long “contact period”. Other filtration systems rely on water pressure that forces water molecules through the filter elements at 60-90 PSI. These water molecules come into contact with the filter media for a mere fraction of a second. By comparison water molecules, passing through the “Tortuous Path” structure of the Black Berkey water purification elements, are drawn gently by gravity and stay in contact with the media for a long period of time. This allows the filter media to be more efficient in capturing contaminates. For example, if you were to hurl 100 steel ball bearings at a large magnet, some would stick but most would bounce off. However, if you were to walk over and gently place the ball bearings on the magnet most, if not all, would adhere to the magnet. Berkey water filter systems fully utilize this principle. This advanced technology was developed, refined, and proven through years of diligent, investigative research and testing performed by water purification specialists, researchers and engineers. The flow rate or time of exposure through the exclusive Black Berkey water purification elements has been calculated to yield the greatest volume removal of toxic chemicals and pathogenic bacteria found in nature and caused by pollution from industry and agriculture. * Except the Go Berkey kit, which comes equipped with one Black Berkey element. We have a bore hole for our water supply. The water has a high content of iron oxide which oxidises when left to stand. Would your system be able to deal with this problem? Yes, the Black Berkey filters are very effective at removing iron oxide. You will see your filters turn an orange/brown color due to the build-up of iron oxide on the Black Berkey’s. This is not a problem, the iron oxide will not clog the filters but they will need to be scrubbed and re-primed from time to time. I am researching in order to purchase a new water filter for my family. My results boils down to two models in the end, Pi Mag Nikken water filter and Berkey filters. Any comments on the way Nikken filters water in comparison with your product? I'm not familiar with the Nikken water filter though I have taken a look just now at the Pi mag Nikken filter. It seems to be basically a carbon filter and they claim that water becomes more alkaline after passing through it. The Black Berkey filter is also made of carbon as well as other materials such as silver which is an antibacterial. The Black Berkey filter is classified as a water purifier, see: The difference between Water Filter and Water Purifier. The Berkey purified water also becomes more alkaline after passing through the Black Berkey filter. All in all I would suggest that the Berkey system is a much better system and producing the best in water purification is their core business. How long is the shelf-life of the Black Berkey filters and how should I store them? If the Black Berkey filters will not be used between approximately 4 to 15 days and you want to avoid the re-priming process, remove the filters from the system, put them in a sealable sandwich bag or plastic container and place the filters in the refrigerator in the front to make sure that they do not freeze. This will allow the filters to stay saturated so that re-priming is most likely not necessary. If for any reason the filters run slower than ususal, then re-priming the filters is recommended. For long term storage, we recommend drying and sealing the filters. The key is to ensure they are bone-dry before storing them long-term, to prevent any potential bacterial growth. One option for drying your filters is to leave them on a window sill for one to three days in the sun and allow them to air-dry. The Black Berkey Primer can also be used to speed up the purging process of the Black Berkey filters. Once the filters are bone-dry, place them in a storage bag such as a large, seal-able plastic bag. The filters are extremely powerful and can absorb odors and smoke from the air. By sealing them in a storage bag, they should not absorb any odors from the air. When you are ready to re-use your filters, clean them by scrubbing the outside with a Scotch-Brite pad or stiff brush. Then re-prime the filters either manually or with the Black Berkey Primer before putting them back in the system. In theory, the shelf life of the Black Berkey filters is indefinite. If the Black Berkey filters are unopened and in their original packaging, please ensure you do not store the elements in an area that also has strong smells to them, such as a laundry room or garage. The elements have carbon as one of their components so it is possible for them to absorb the odors of the room they are stored in. For example if they are stored in a laundry room, it is possible for the material in the filters to pick up the odor of highly fragranced items such as laundry soap. What happens to the Black Berkey filters when the temperature drops below 0° Celsius? Can the Black Berkey filters withstand freezing temperatures? The Black Berkey filters must not be exposed to freezing temperatures equal to or below 0° Celcius, this will ruin the filters. I recently purchased a Big Berkey water filter from you. After a couple of weeks I decided to check the bottom reservoir. I have found a build up of what I find hard to describe but its like a grit/silt/salt like residue on the bottom of the tank. Any idea what would be causing this? It's nothing to be concerned about, this is normal. When water passes through the Black Berkey filters it changes the ionic charge of the minerals and becomes more alkaline. Alkaline water is less able to hold minerals in solution and some of the minerals will precipitate out and build-up in the lower chamber. These are minerals which were were once invisible and now visible, they cause no harm. Every couple of months you can wash out the lower chamber to clear the grit. The same happens with our Berkey at home by the way. I've just received my new Black Berkey filters and I noticed that there is a slight chipping on the end. Is this normal and will this affect their performance? Yes this is normal, a slight chipping can occur during the production process. This has no effect upon their performance, the filters have a high built in redundancy. I would like to know if the Black Berkey water filters also make hard water soft. Do the Black Berkey water filters decalcify or soften the water? No, the Black Berkey filters do not soften or decalcify water. One of the main advantages of the Black Berkey filters is that the beneficial minerals present in the water are not removed such as with reverse osmosis or distillation. For a further discussion of this issue please see also: Berkey, Reverse Osmosis and Distillation Compared. You may find that the limescale buildup in your kettle is less or disappears completely using Berkey purified water. For instance you may see white particles floating in the bottom of your kettle instead of building up on the element. This is due to the fact that the ionic charge of the minerals changes by passing through the Black Berkey filters, the water is then not able to hold all the minerals in solution and these minerals then precipitate out and float in the bottom of the kettle. If I do not use the Black Berkey filters within one year, how long can I wait until I use them, is there a deadline? After several years or more of storage are the filters still usable and not worn out? The Black Berkey filters can be stored indefinitely as long as you keep them in the original packaging or a plastic bag in a dry place. Do the Black Berkey filters have a published micron rating? With respect to the micron rating, we do not use or publish a micron rating for the Black Berkey filters for the following reasons. There is alot confusion with respect to nominal and absolute micron ratings. An absolute micron rating is one that states the maximum pore size expected within a filter. The nominal micron rating is the average pore size within the filter. This means that if 90% of the pores are .02 microns and ten percent are 2 microns, one could claim the nominal micron rating as .2 microns, which would then imply that pathogenic bacteria and parasites would be totally removed. But in reality the greater part of the water would pass through the larger 2-micron pores and thereby allow both bacteria and parasites to get through. Therefore a nominal micron-rating claim can be very misleading. With respect to the absolute micron rating, there is also confusion because there are two different standards to determine absolute; in the US the standard is 99.9% removal, but internationally the standard is 99.99% removal or 10 times greater removal. Clever marketers of products can use the confusion over the above differences to make product "A" appear to be better than product "B" when product B may be far superior in reality. For example, Berkey USA used to report an absolute rating using the international standard because they have a large international customer base. Several years ago they published a rating on their ceramic filters. A particular company began to publish that their filters were .9 microns whereas theirs were .2 microns. However, Berkey USA’s micron rating was based on absolute (international) while theirs was based on a nominal (US) rating. When tested at Spectrum Labs, it was found that at the .2 to .3 microns range our filter removed more particulate than the other brand. Unfortunately many people make there purchasing decisions based on a micron rating that can be legitimately and significantly distorted. Berkey USA soon became weary of trying to explain the above to their customers and so decided not to participate any longer in publishing a micron rating. Rather, we think an absolute pathogenic bacteria removal rate is a far better gauge because it is far more difficult to abuse. Based on that criterion, the Black Berkey elements remove greater than 99.9999999% of pathogenic bacteria such as E.coli. To our knowledge, no other personal water filter can match that capability. In fact, the Black Berkey filters are so powerful, they are unique in their ability to mechanically remove food coloring from water. I have come across disturbing information in the news today that British water is contaminated with residues of cocaine (benzoylecgonine). I was wondering if your Berkey filters can handle this and other pharmaceutical residues mentioned in the article? The Black Berkey filters have now been tested for the removal of pharmaceuticals and have been found to be very effective. Please see the latest independent lab testing by Envirotek Labs. I bought a Berkey water filter about a year ago. Its been fine until recently - now it won't filter all the water through and gets stuck about 2/3 down. I know the filters are supposed to last longer than this, please could you advise on what I should now do? It sounds to me that what you are experiencing with the filters is that minerals (esp. nitrates or salts) in your water are clogging up the smooth sides of the filters, this can happen but it is very rare. If you could please try the following remedy for this: remove the filters and then taking a knife shave the filters like an old-fashioned barber / scrape the filters like cleaning a carrot (not like whittling a stick). This does two things; it roughens up the sides of the filters and it removes the layer of minerals causing the problem. Please don't hesitate to do this vigorously the filters have a high built in redundancy and they won't be harmed. After shaving/scraping always re-prime to remove any particles that may have been pushed in by the shaving/scraping. This should resolve the problem. I was wondering whether the Black Berkey filters remove chloramine? Yes, in testing done by Envirotek Laboratories in late 2014 it has been confirmed that the Black Berkey filters remove chloramines to a level greater than 99.9% For the complete test results please see Envirotek Lab Test Results. How are the Black Berkey water filters able to remove radioactive contaminants for their full lifespan? Many water filters can show strong results that quickly decline. As such, we think it to be vitally important, with certain contaminants, that the reduction capability of our Black Berkey filters be tested over time. Such tests provide the rate of decline in efficiency and allow our customers a verification that the rate of decline is not significant. As an example of a significant rate of decline, we are aware of other filter filters that claim fluoride reduction at 100%. Yet, in a time test and after only 150 liters, the reduction rate falls to a mere 82.4%; this is nearly an 18% drop in performance after just 150 liters. While an initial drop in efficiency is always to be expected, the 190 liter test serves to verify that such drastic reduction does not take place with the Black Berkey water filters. For example, in our Gross Alpha reduction test, the efficiency reduces from 99.2% to 98.7% after 190 liters. This represents a reduction in efficiency of only 0.5% (1/2 of 1%) after 190 liters, which likely indicates that at the end of the 11,350 liter life of the filter, the reduction level should still be around 70%. By the way, Berkey could have conducted the radiological contaminant reduction testing on the first gallon only, which would have been significantly less, in terms of cost. However, because of the serious nature of these particular contaminants, this would not provide our customers with a realistic understanding of how their filters would perform during a short term nuclear crisis situation. As such, the testing of the Black Berkey water filters was conducted to 190 liters; an extreme situation and test. To our knowledge, this is the most liters tested of any other water filter, which gives our customers a far better understanding of the filter’s actual capabilities for removing radiological contamination from water in a highly contaminated hot zone. Moreover, it is important to understand that radiological contamination is quite different from most other contaminants in that such contamination is typically not present in drinking water that is utilized over long periods of time. In most cases radiological contamination occurs after some sort of nuclear accident or event. In such cases the primary objective for those in the contaminated hot zone is to clear the area and to get to a non-contaminated zone as quickly as possible. It is highly unlikely that anyone would purposely remain in a hot zone for a long duration of time. Rather, during such events, the removal of radiological contaminants is typically needed for a short period of time during the evacuation process. Additionally, it is important to keep in mind that most Berkey water filter systems come with at least two filters. Therefore, the reduction efficiency is effectively doubled with two filters. In systems with four filters, the reduction efficiency is quadrupled, six filters would mean six times the efficiency, etc. For those who are unfortunate enough to be caught in a radiological contamination zone, it is recommended that the Black Berkey water filters be replaced as soon as is reasonably possible. This is because the more radiological contaminants the filters remove, the more radioactive the filters themselves become. What's the difference between the Doulton ceramic filters and the Black Berkey filters that make the Black Berkey filters more expensive? The main differences are that the Black Berkey filters have a much longer lifespan; up to 11 years based upon usage of 40 liters/week and the Black Berkey filters are classified as water purifiers as opposed to water filters, see Water Filter Vs. Purifier for a detailed description. I am considering purchasing a Big Berkey water filter. I travel quite a bit, for between two days and a week. Will I have to reprime the Black Berkey filters every time when I get back home? For anywhere between 2-4 days you most likely won't need to reprime, above 4-5 days it's more likely especially in the summer. I was just away for 5 days with the Berkey upside down airing out in the dishrack and didn't need to reprime upon our return, the house was not heated in our absence. If you find that you're usually away for more than 5 days it might be handy to consider purchasing a Black Berkey primer with your Berkey system.